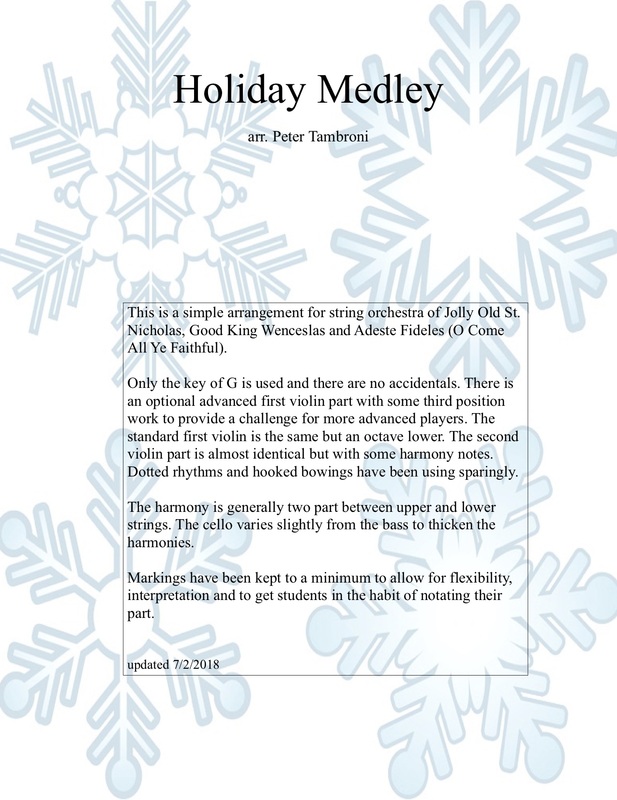 Need some holiday music for your young string orchestra? I arrange and play these with my own school orchestras. Both students and audiences have enjoyed them. 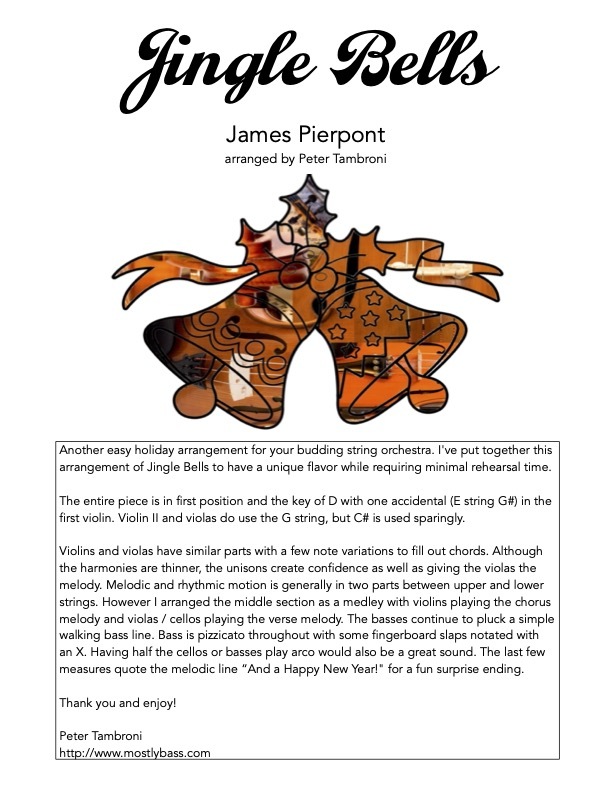 Another easy holiday arrangement for your budding string orchestra. I've put together this arrangement of Jingle Bells to have a unique flavor while requiring minimal rehearsal time. The entire piece is in first position and the key of D with one accidental (E string G#) in the first violin. Violin II and violas do use the G string, but C# is used sparingly. Violins and violas have similar parts with a few note variations to fill out chords. Although the harmonies are thinner, the unisons create confidence as well as giving the violas the melody. Melodic and rhythmic motion is generally in two parts between upper and lower strings. However I arranged the middle section as a medley with violins playing the chorus melody and violas / cellos playing the verse melody. 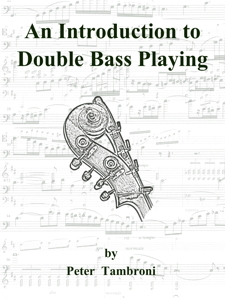 The basses continue to pluck a simple walking bass line. Basses are pizzicato throughout with some fingerboard slaps (notated with an X). Having half the cellos or basses play arco would also be a great sound. 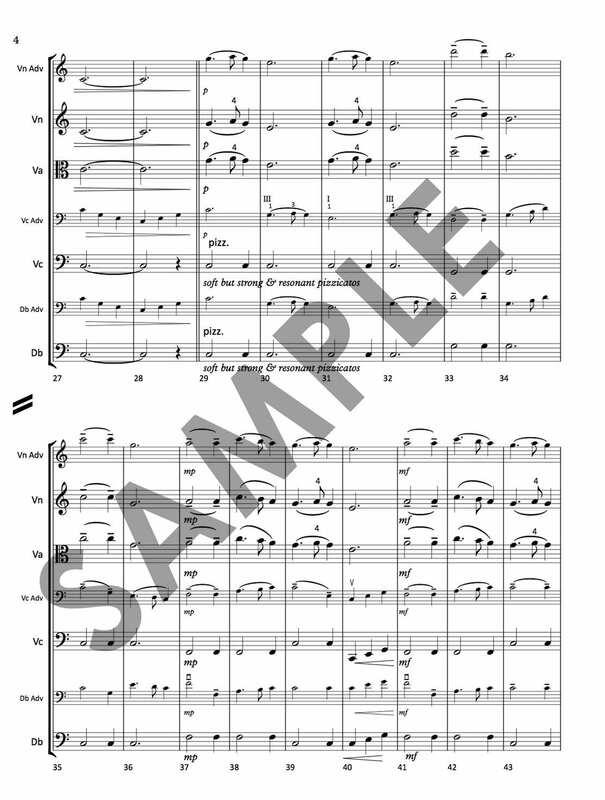 Click image for score sample. 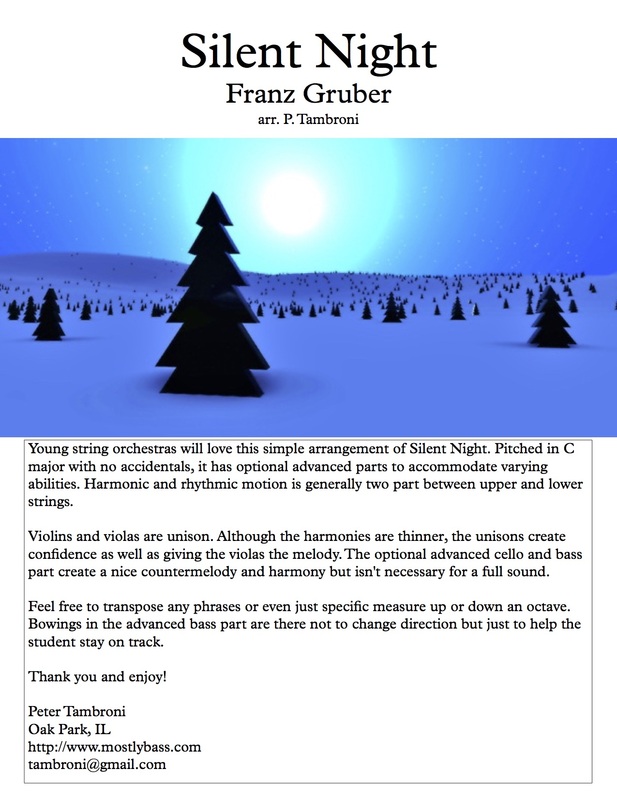 Young string orchestras will love this simple arrangement of Silent Night. Pitched in C major with no accidentals, it has optional advanced parts to accommodate varying abilities. Harmonic and rhythmic motion is generally two part between upper and lower strings. Violins and violas are unison. Although the harmonies are thinner, the unisons create confidence as well as giving the violas the melody. The optional advanced cello and bass part create a nice countermelody and harmony but isn't necessary for a full sound. Feel free to transpose any phrases or even just specific measure up or down an octave. Bowings in the advanced bass part are there not to change direction but just to help the student stay on track. 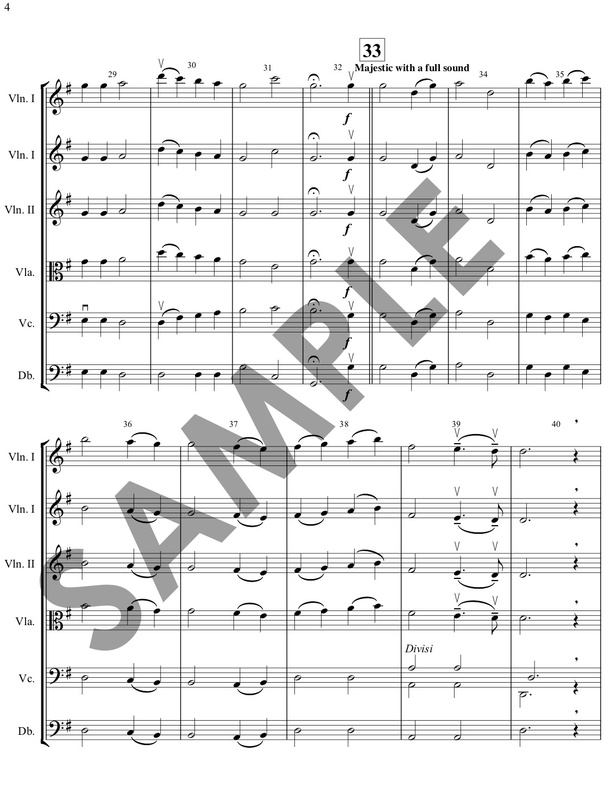 This is a simple arrangement for string orchestra of Jolly Old St. Nicholas, Good King Wenceslas and Adeste Fideles (O Come All Ye Faithful). Only the key of G is used and there are no accidentals. There is an optional advanced first violin part with some third position work to provide a challenge for more advanced players. The standard first violin is the same but an octave lower. The second violin part is almost identical but with some harmony notes. Dotted rhythms and hooked bowings have been using sparingly. The harmony is generally two part between upper and lower strings. The cello varies slightly from the bass to thicken the harmonies. 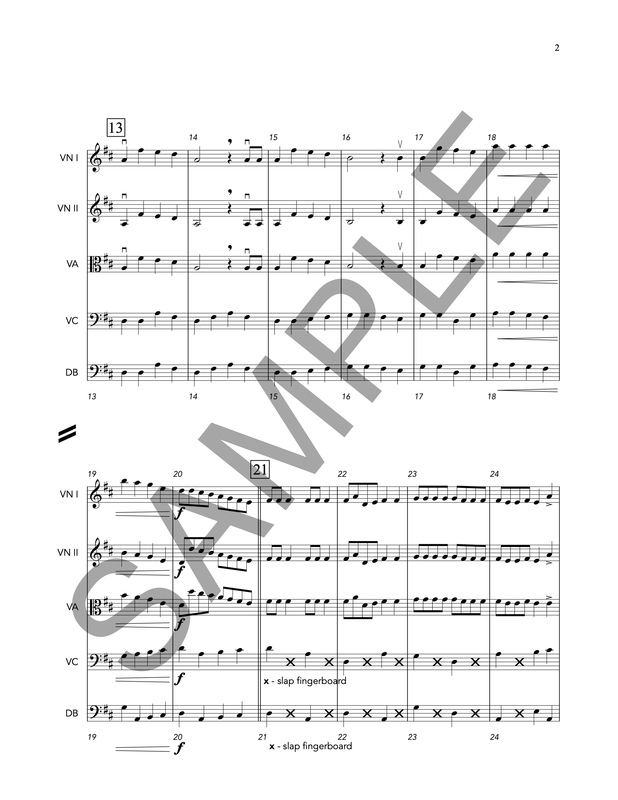 Markings have been kept to a minimum to allow for flexibility, interpretation and to get students in the habit of notating their part. Fabulous…you know you are not getting the recognition for all of your creative talents, my friend!